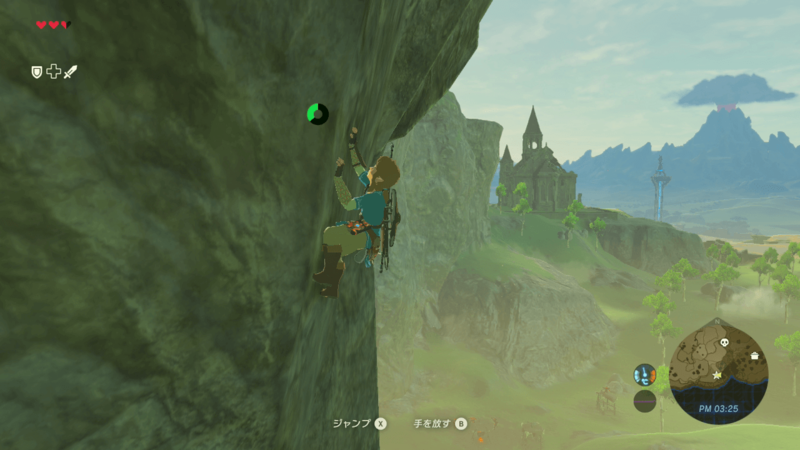 Nintendo Japan release a few Legend of Zelda: Breath of Wild screenshots with their latest gameplay video. Since we are guessing on a March release, I thought it would be fun to analyze some of the gameplay and pacing used in the video and screenshots. I’m not really sure why they are planning to do a dual console Zelda release, but they’ve had success with it before. As Zelda is one of their largest franchises, we can expect this game to be exciting and, based on the footage, offer new gameplay tactics! 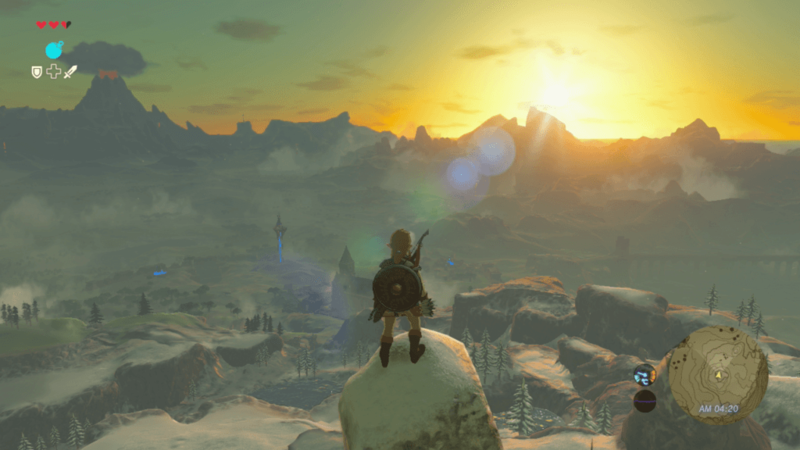 First, In this shot we see Link standing on a Snow capped peak, overlooking a valley. The far off erupting volcano is Death Mountain, a popular staple in Link’s past (or future? ), and is sure to house a dungeon. In the valley we can see a large building/church with a blue glow coming from nearby hills and villages. Continuing right, we can see a span resembling the Bridge of Eldin from Twilight Princess. One of the interesting gameplay mechanics I see is switching of weapons and shield using the D-Pad. Also the bottom right of the screen shows time and temperature, implying that in Breath of Wild Link’s body temperature must be monitored. The visuals here are absolutely stunning. A creative mix of previous Zelda titles, and new looks, give this a very mature look. Notice the falling leaves and blowing grass, another nod toward environmental mechanics by Nintendo. Also we can see the topographical map showing some elevations next to the temperature sensor, now displayed in Fahrenheit. Link is drawing his bow to fire, the arrow count shown next to the triangular crosshair. This is in contrast to previous Zelda titles where first-person view (not counting Z-targeting) was used when drawing a bow. I take this as change in the battle system to allow you to better fight multiple enemies with ranged weapons. The cross hairs also ‘tighten’ depending on draw time. Again we see our fateful hero in a gorgeous landscape. With crumbling arches to his rear, he stands next to a cauldron cooking mushrooms over a fire. Link is wearing a blue tunic here, possibly a water tunic, and likely producing a potion for health. 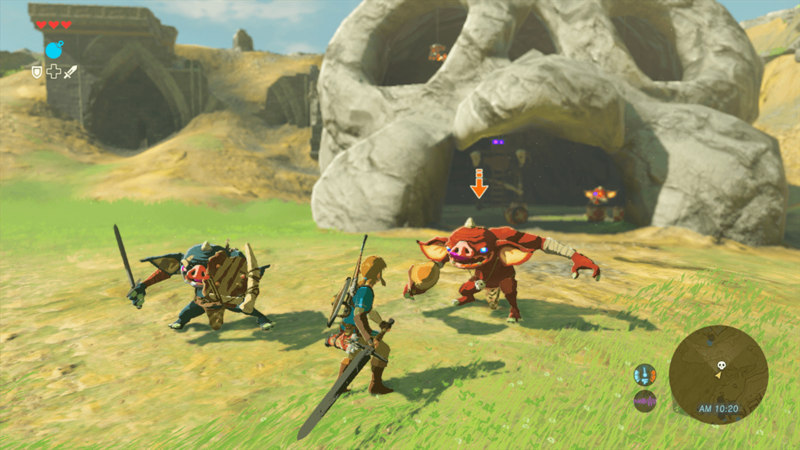 This is likely a cut-scene that happens by link is cooking given the lack of map, buttons, or other screen options. This looks a lot like the enemy encampments from before! 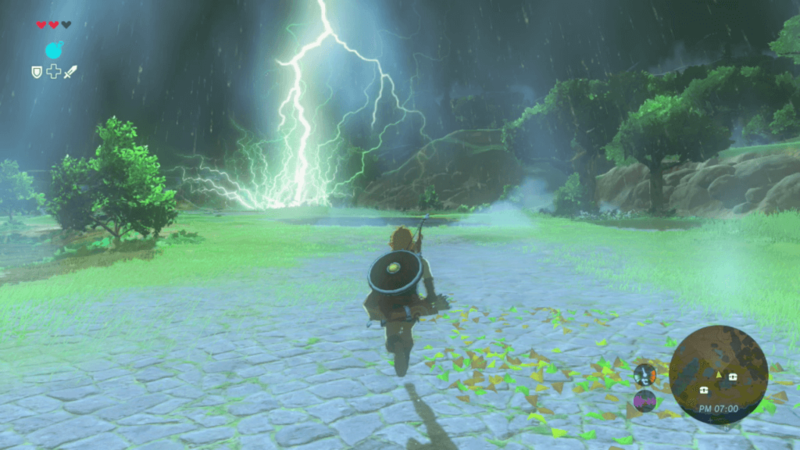 This is a humbling display of Link’s badassness as he runs into a lightning strike. 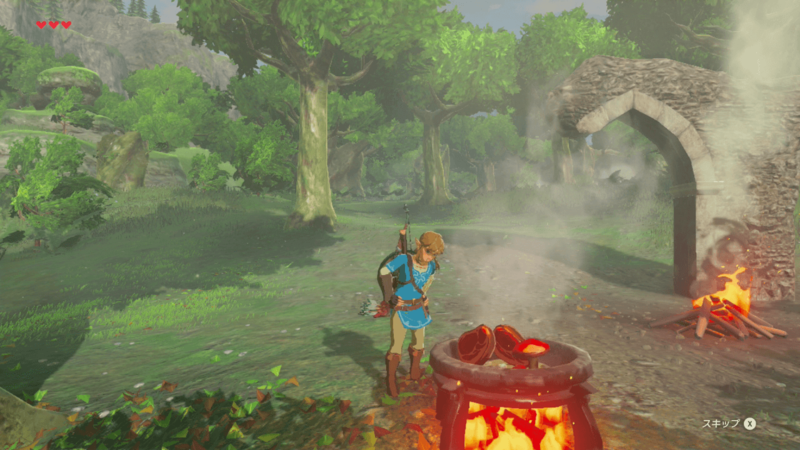 This visual is stunning and, again, shows the importance of the environmental factors in Breath of Wild. The rain and wind seems to have dropped the temperature chart, and now I see a purpose for the purple line – Sound metering. A sound meter is interesting because allows you to see what is happening in the game from another sense perspective. It could add sneaking as a more central part of the game, not just focusing on not being see, but not being heard. As Nintendo pointed out, this dungeon is an homage to the original Legend of Zelda with its shaped entry. We can verify that skulls on the mini-map now represent dungeons. Also we’ve seen in gameplay footage that you can shoot the lantern in the eye socket to ignite the explosive barrels below. Link also has a claymore, or the Giant’s Knife, holding it in two handing Zatoichi style. The “arrow” over the enemy’s head indicates a likely return the selective targeting in combat. Link’s return isn’t much without swimming. A staple since the mid 1990’s, Link wouldn’t be Link unless he was a great swimmer. 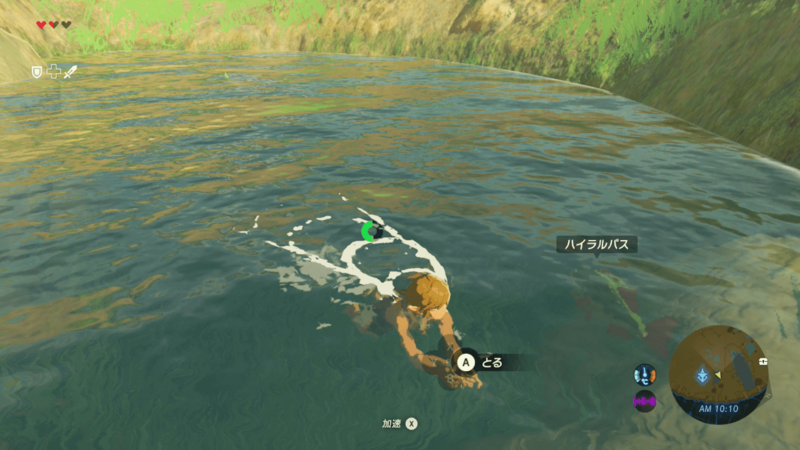 Again we see a stamina bar, possibly indicating total swim time, or swimming sprints. I could see that meter being used for oxygen time under water as well (thing Super Mario 64). Without a doubt the water looks amazing! Nintendo made a surprisingly excellent decisions not to do the cell-shaded graphic style from Wind Waker for this game’s water physics. 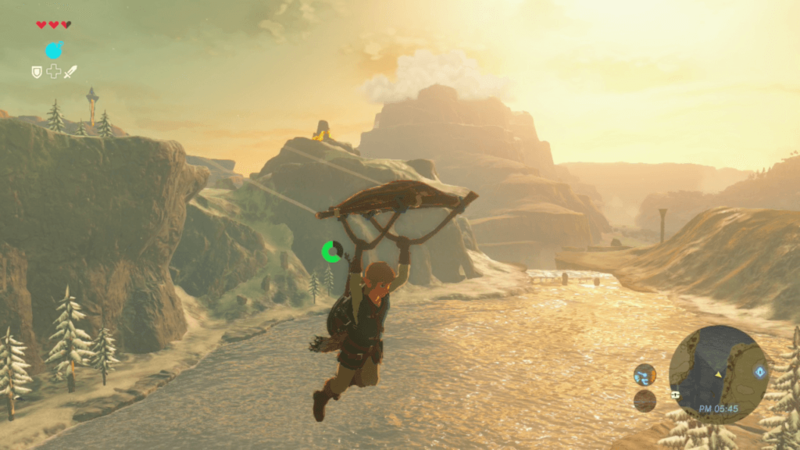 Lastly, we see link gliding from a higher cliff over a body of water. Using his shield as a sail, he could cross treacherous areas with ease using this tool. Is there is a method to control wind in this game we could see this being integral to in game puzzles. The stamina bar likely shows total glide time, and again the temperature bar is now see lower (see the snow capped trees?) There is another platform in the top left that remains a mystery. I’m very excited for this game to come out, although we don’t have a firm release date. It will no doubt be a launch or near launch title for the Nintendo Switch as it was demoed in the reveal trailer. Nintendo has invested a lot into this game, and their reveals have been amazing. Whether you get this for the Wii U or the Switch, this game will be a must have for any Legend of Zelda fan. 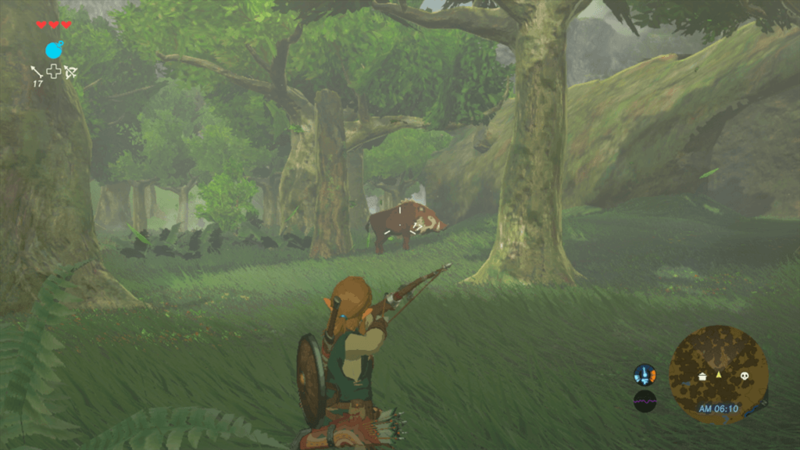 Please let us know your thoughts on these Breath of Wild Screenshots!